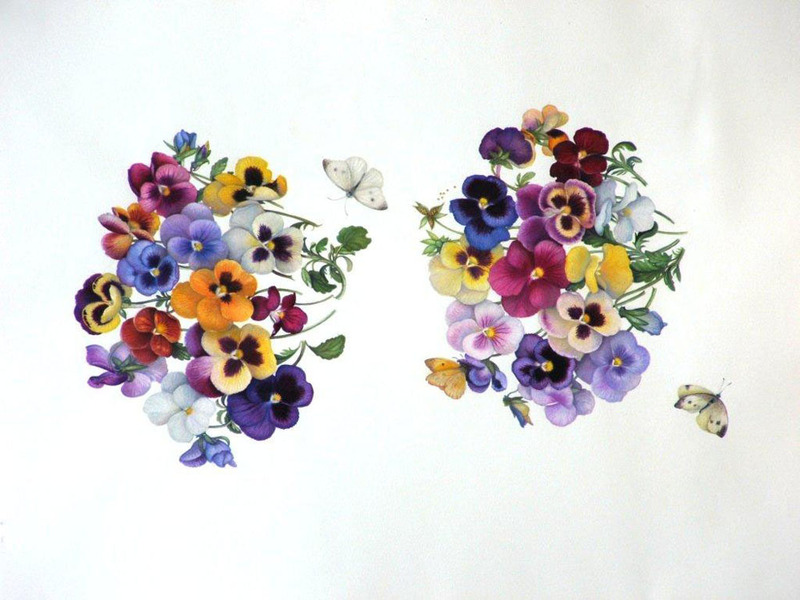 This arrangement could as well be entitled “A Few of my Favorite Things.” I’m always looking for the archetypical combination of pansy colors – I return to them as a subject again and again. As in the garden they delight and surprise, so do they on the page. I was thrilled when Marvin Bloomquist notified me in April 2010 that the Granite Spiderwort was blooming. Marvin had approached me after my presentation on the “Rare and Endangered Plants of Texas” to the Highland Lakes chapter of the Native Plant Society, saying that he had this little perennial on his ranch. It is listed in the “Rare Plants of Texas” and grows mostly in the fractures of pink granite-derived soils of the Llano Uplift. 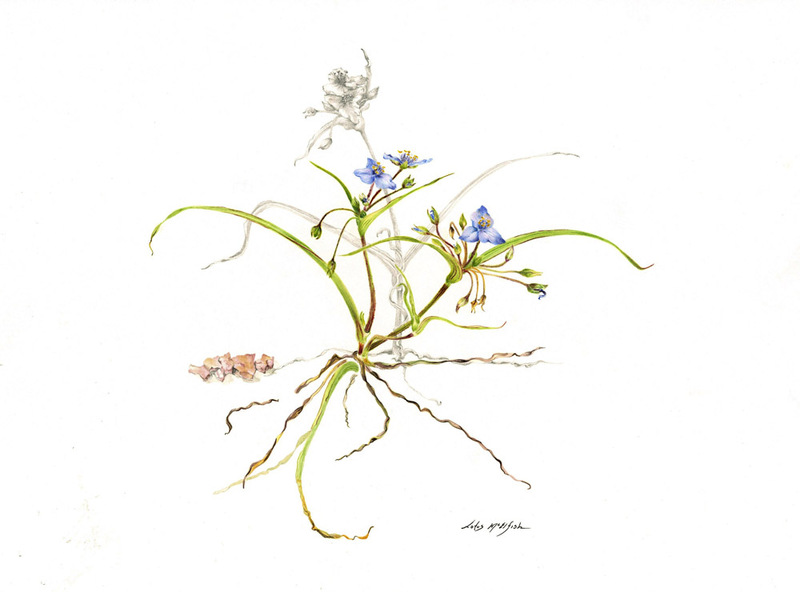 This painting is the result of a day painting and studying on his Boil Spring Ranch, where he protects and monitors this tiny (30 cm) Granite Spiderwort. 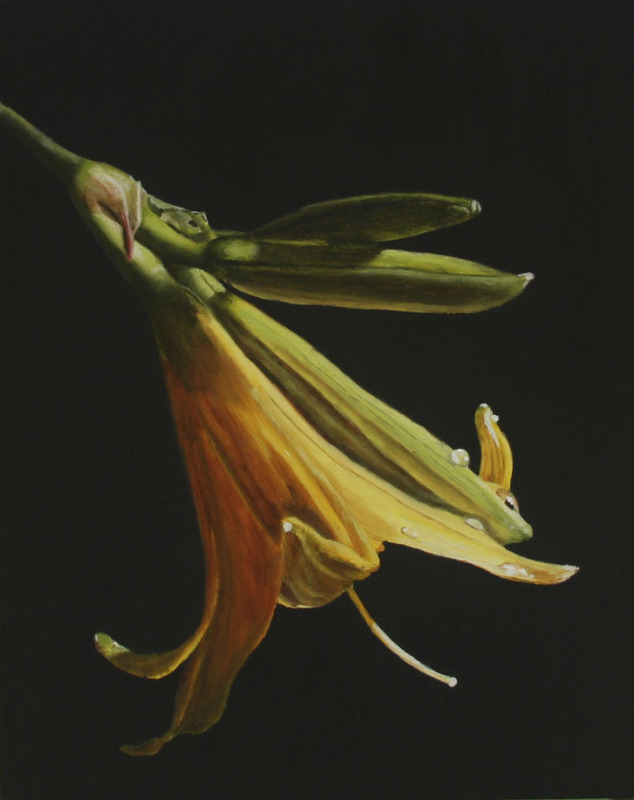 I tried to capture the delicacy of this plant as well as its tenacity – these are tough conditions! 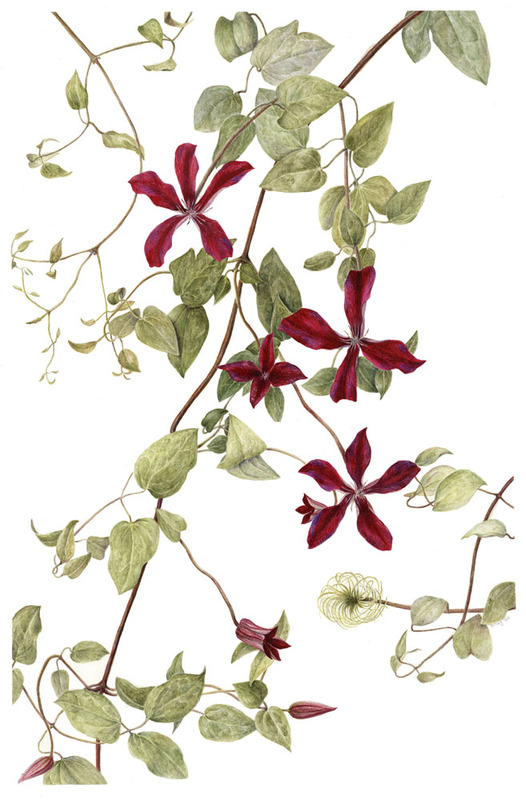 Visiting Britain, I came to love the sight of Clematis scrambling through trees and lurking in borders, so I resolved to add some to my California garden. While searching for antique varieties, I soon discovered ‘Gravetye Beauty’, named by William Robinson for his beloved home in Sussex. My own ‘Beauty’ has been happily trailing down a chimney pot outside my window for many years now, treating me to a wondrous explosion of red-velvet stars each summer. Capturing its delicate complexity and intense ruby flowers was challenging but my sudden discovery of the variable number of sepals was a magical reward! I enjoy painting “portraits” of flowers. My wife has a green thumb, and her gardens provide me with an almost endless source of inspiration. One morning after she finished watering the garden, I noticed the water droplets on one of the yellow lilies and the translucent effect the lighting had on it, and knew I had to attempt to capture its beauty. Tucson, Arizona, within the Sonora Desert, is rich with amazing arid land plants. I have lived in this area for 30 years and love the forms and flowers of the cacti and succulents that are native here. The trichocereus cactus is a relatively low profile plant with arms that spread along the ground as it grows. The most amazing show of flowers seems to occur overnight in the early spring and lasts for a few days. This particular plant was spotted only after I saw its beautiful blooms. I gathered my drawing materials and made several preliminary sketches and color studies on site and took many photographs, knowing the flowers would not be there long. This year I anticipated the spring bloom of the same cactus and was again rewarded with an incredible show. 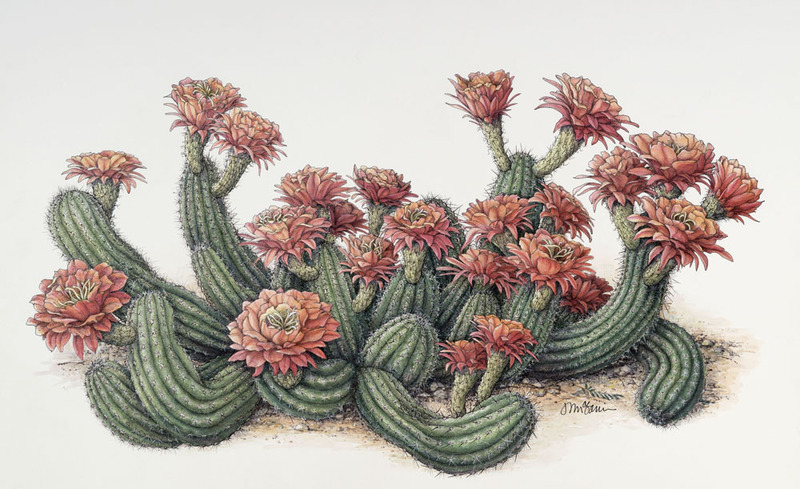 Pen and Ink is a medium that lends itself well to describing the spiny texture of this plant and watercolor works to illustrate the range of color in each beautiful blossom.